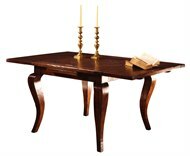 The Montpellier TabLe is one of our classics. It's made in solid mahogany with a bookmatched center field. The surface is softly scraped, distressed and stained to a beautiful deep golden color. Custom sizes, finishes and timbers are available.